The gun-control debate may have receded from memory, but advocates are still pushing Congress to take action. The congressional gun control debate of early 2013 seems like a distant memory to many people in Washington—and the failure of universal background check legislation ensured the Newtown school shootings had essentially no impact on federal law. But the legislation’s proponents were back on Capitol Hill on Wednesday, trying to jump-start the gun-control push despite even an even more hostile climate in Congress following the midterm elections. 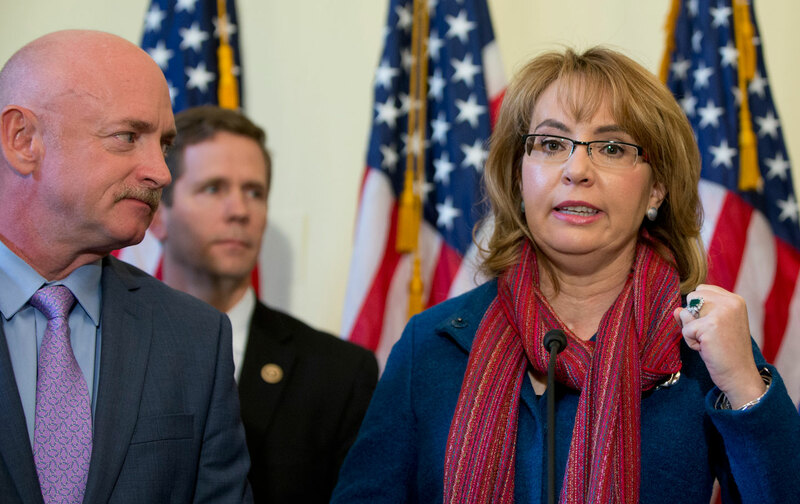 Eight House members reintroduced the background checks legislation that never received a vote in the 113th Congress, as former Representative Gabby Giffords and her husband Mark Kelly lent their support to the bill. The bill, authored by Representatives Peter King and Mike Thompson, would expand the existing background-check system to cover nearly all gun transfers in the country, and would close the gaping gun-show and online-purchase loopholes. It would also provide incentives for states to give the national background check system better information, and also establish a national commission on mass violence. It never received a vote in the House during the last Congress, and the very similar Manchin-Toomey legislation in the Senate failed to clear a filibuster in April 2013. Today, the Senate has been taken over by Republicans and almost certainly holds fewer pro–gun control members, and the Republican advantage in the House has expanded. But proponents of King-Thompson insist the legislation would still pass the House if Speaker John Boehner gave it a vote. “We need to get a vote on the bill, and when we do, we’ll get it passed,” said Thompson. As evidence the bill could pass, he cited the public support of 189 House members for this legislation in the last Congress, and the “private support of a clear majority,” along with the successful vote last year to devote more funding to the national background check system. The bill does indeed enjoy bipartisan backing so far: of the eight co-sponsors, four are Republicans: Representatives Peter King, Bob Dold, Pat Meehan and Mike Fitzpatrick. But it almost certainly wouldn’t get the support of a majority of Republicans, and Boehner is under ever-increasing pressure not to irritate his caucus by violating the so-called Hastert Rule and bring up legislation that would pass with a majority Democratic support. The idea now is to at least keep the legislation in the public eye, and try to build in more support—something that might be easier without an overheated national debate on gun control, which was the case last time around. Dold, a Republican, told reporters he will have a conversation with Boehner in the near future and urge a vote.